Sydney three-piece Retrograde are set to become one of the most talked-about newcomers on the Australian music scene, having honed their craft since early 2017 and creating a sound that they are really proud of. Now, the band are finally gearing up for the release of their debut single on March 6 titled -You. Me. Sanity', a track well worth waiting for. Hailing from Sydney's North Shore, Retrograde have cleverly curated an eclectic track that blends the sensibilities and sheen of synth pop with the raw guitar driven sounds of alternative rock. 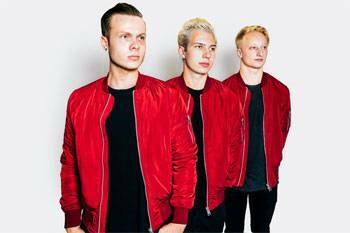 They use production and rhythmic approaches that could compare them to the likes of English protégés, The Wombats and Everything Everything, amongst other personal influences. -You. Me. Sanity' is quite simply, infectious. It paints the picture of the beginning of something new – a personal change and the venture in to the headspace and lifestyle of a new found relationship. 'It very much represents what this band started as for me," says vocalist Samuel Edward. 'A culmination of decisions to move forward." The band – comprised of Samuel Edward (Vocals/Guitar), Cody Stebbings (Bass) and Austin Megier (Drums) – enlisted the production talents of Sydney producer and long-time friend, Dylan Nash. Together with Sydney award-winning filmmaker, Kane Senes and Shaun Dougherty, they have produced a polished music video that aptly represents the band's image and personality. The birth of Retrograde was somewhat accidental. 'As I was writing demos for a band I was in at the time, I found it became increasingly clear that the music was deserving of its own project," Samuel says. 'I quickly contacted long-time friends (Austin and Cody) to see if they'd want a part in starting the new band." And so begun a band that could vastly put electro-pop back in to the forefront of Australia's industry. Whilst the band and single is finally unearthed to global audiences for the first time, the trio have already bunkered down in the studio to record what will be their follow up releases ensuring that there will be plenty more Retrograde to come. Live shows aren't far off either with the band mapping out their assault on Australia's East Coast for later this year. Samuel Edward: Synth pop/electro pop mixed with alternative rock. Question: What inspired the song, You. Me. Sanity? Samuel Edward: The single was a culmination of the year or so prior for me in my personal life. Musically I think it very much draws from bands like The Wombats. Samuel Edward: We haven't had the chance to play our material live yet but You. Me. Sanity. is definitely the most energetic in practices, so I'm sure it'll be the favourite on the road! Samuel Edward: As corny as it may be I'd love to have my guitar teacher from my school days at a show. I don't think he's ever seen exactly what I do now in a live setting. Samuel Edward: They both have their merits but I think we particularly enjoy being in the studio and having the chance to really dissect our own music and writing styles. Question: What is the story behind the name, Retrograde? Samuel Edward: Nothing too flash, unfortunately. It was just the name that stuck in our group chat. It has a nice ring to it now though so I like that we went with it! There were far worse ideas that I'm glad never gained traction. Samuel Edward: It all started with a collection of demos I had in early 2017 that I felt warranted a full band project. Austin and Cody were the first people I sent the demos to and they were both really keen! Samuel Edward: That constant voice in my head that forces me to keep trying to come up with new ideas. Samuel Edward: Everything Everything's latest 2 track is great! I've been listening to a lot of my friend's new music, so Zac Sunset and Undercast have been getting a spin. Check out our playlist on Spotify to see what we're listening to at the moment! Samuel Edward: For me it was probably my guitar tutor throughout high school. I think bands like Metallica and ACDC were the big inspirations from a young age though. Samuel Edward: I'd love to write with Josh Ramsay. I'm a total sucker for his melodies.